1) Taxation of Property (1st Plank of "The Communist Manifesto"). I found also in a read of "The Communist Manifesto" that the function of its 10 Planks is to twist a nation with a free market economy (including freedom of conscience and exchange of ideas) into a godless, secular humanist socialist communist slave state. We will save the details for the class action law suit. (b) reject slavery categorically, if already free (I Corinthians 7:23). 2) especially since 9/11/2001 imposed new uses for the Social Security Number that are unrelated to its original intent of individual dealings with the Social Security Administration, such that one may now not "buy" land, cars, homes, renewed professional licenses, pass ports, etc. "or sell" labor (see: Revelation 13:17) without the Government imposed control number (see: Revelation 13 and 14). Relief sought: Do away with or allow a simple "opt out" with no negative consequences for Christians who do not wish to be slaves or be in such close proximity to the "mark of the beast" issue, in accordance with Biblical teaching. No requirement to have or use a national id card, etc. Like a giant python, the U.S. Government is squeezing Christians into the mold of slavery and the "mark of the beast" more each day. We have an opportunity here to set a strong legal precedent that will both free Christians from slavery now and perhaps give some breathing room to those Christians who will live through the time of the Beast. 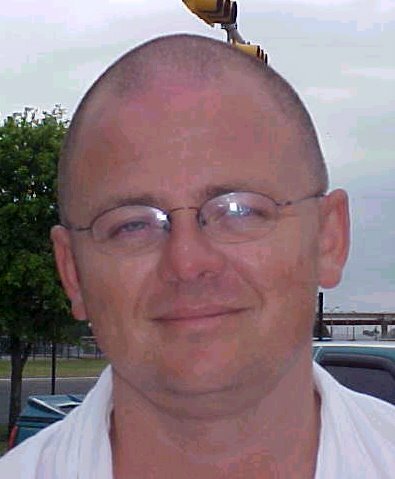 (Note: According to I Corinthians 7:21b, one may infer that when Christians do not seek freedom from slavery (i.e. income taxes: flat or graduated, property taxes and being counted like cattle), it may cost souls their salvation in Christ. The human author of Corinthians, Paul the Apostle, used his freedom to win souls; he feels clearly that there is a "use" for our freedom seeking. Holy Scripture indicates that there will be a shadowy ambiguity present in the world surrounding the imposition of the 'mark of the beast' (see: Revelation 13:18). In a day when governments around the world a counting their citizens like cattle in order to impose income taxes and property taxes (see: Revelation 13 and 14) . . . In a day when our own American soldiers are having Global Positioning identifier microchips placed under their skin by our Government, Christians are no longer in a position to toy with any shadowy ambiguity that may be left in the slavery/ mark of the beast issue. Its paws are on our chest, and it is licking us in the face. We are at a life and death juncture!!!! Those who are of Christ must now step out or by their silence reject Christ for the Beast's system NOW!!!! Well, I hear the jury is still out on Irwin Schiff's trial. Be in prayer for his success. I've not been to my mail box to see if the class action idea is getting any bites yet. Thanks to Jon for passing out our materials in LA. 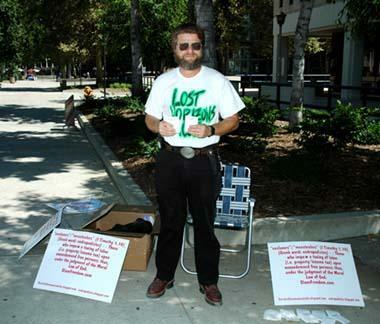 John Vories handing out Gene Chapman tracts in front of IRS building in California.